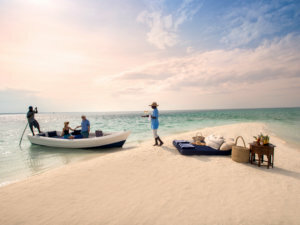 Benguerra Island is a legendary Mozambique destination and to find out more all you have to do is read our articles and information about this spectacular place. It features wonderful Bazaruto hotels and amazing ocean-related activities. Check out Mozambique Travel’s articles and information on Benguerra Island and you can then decide whether this tropical paradise in Mozambique’s Bazaruto Archipelago is for you. 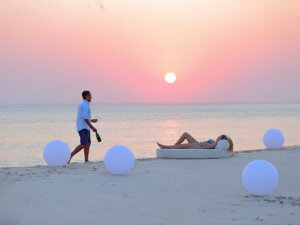 Luxury lodges and all the famous Bazaruto hotels can be booked through the Mozambique accommodation specialists! For accommodation ideas read the articles about the amazing beach villas found down on the beach at Azura Retreats Benguerra – these ultra-luxurious and spacious air-conditioned chalets all have cool textured Egyptian cotton spreads over the king sized beds with mosquito nets, and massive en-suite bathrooms. Picture private plunge pools, free Wi-Fi, laundry facilities, and a spa! Find out more about Azura here. Or journey on around the island to &Beyond Benguerra Lodge with its brand new, revamped villas, radiating a Portuguese-Arabian feel about them. Maybe you will sit on your private deck and cool off in your plunge pool or lounge under your thatched gazebo. Or relax in a large lounge and spread out on king size beds, thinking of the romance of the islands long ago. Look out for the rare dugong and hear tales of this mystical creature from the local people who still fish from traditional Dhows! Mozambique Travel has all the information you need to decide where you are going to spend your holiday and how many activities you are going to indulge in. Read our articles about the lodges and how previous guests have enjoyed their stays…. you can almost taste the succulent crayfish and prawns that chefs conjure up in the kitchens! Click here to source our interesting information. For deep sea diving and fishing, look no further than Benguerra Island. Fully equipped dive centres will sort out all your diving needs – the famous Two Mile Reef will show you the rich marine life of the Indian Ocean around the Bazaruto Archipelago. Maybe you will be lucky enough to spot the elusive, endangered dugong, grazing sea grasses on the seabed? There is a large tidal difference on Benguerra Island and this affects most island life. Some activities are only possible during low tide and access to the ocean for swimming is much deeper at high tide. As the shoreline moves with the tides, it creates an incredibly beautiful and changing landscape. So go snorkelling to see underwater sights that take your breath away. 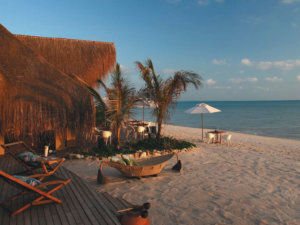 It is Bazaruto Hotels like these two that make your Mozambique holiday on Benguerra Island so worthwhile. Can you imagine waking every morning to a crimson sunrise, flat blue sea and pure silence? Contact one of our consultants to tailor make your holiday here, in accommodation that deserves writing about! Book your Mozambique package for 2019 with us.